At a very early age, growing up in Redondo Beach, California, I enjoyed growing all kinds of plants. I especially liked to slip begonias, coleus, and other things, many of which stood no chance of growing. Later, a friend who was studying Landscape Architecture in college gave me a rather respectable collection of bromeliads. When I was 17, one of my Boy Scout leaders and his wife gave me my first bulb - a Veltheimia bracteata. I still have some of the offsets from that original bulb. Today I live in Long Beach, California, an area with a marine climate with low rainfall that occurs during the mild winters and summers that are cool. I have broadened my interests, but not too greatly. While I may have one of the most comprehensive collections of Veltheimia, my main interests include Haemanthus and Scadoxus. I have been trying to expand the numbers of bulbs of these three species so that I can become more active in trading. I do enjoy trading bulbs so long as both parties are able to acquire something that they want. I am an educator, not a botanist. I am willing to share my experience which is based strictly on observation, not scientific knowledge. 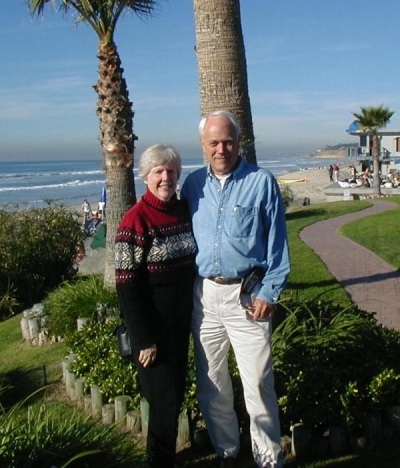 This photo was taken December 2001 overlooking the Pacific from Leucadia toward Long Beach and shows me and my wife in the foreground.